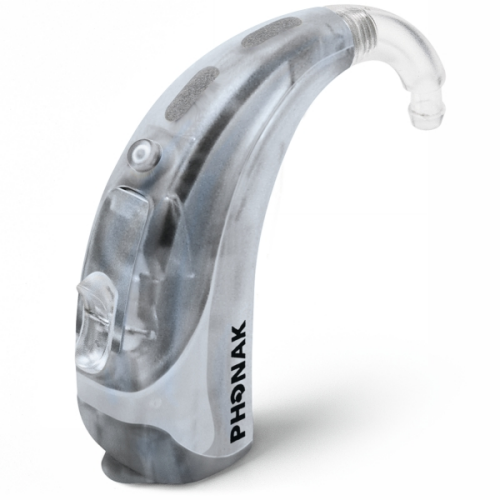 Updated November 4, 2016 – Phonak’s Naída hearing devices are extremely advanced, versatile hearing devices designed to deliver hearing to individuals with hearing loss ranging from mild, to profound. With 4 different styles and up to 19 different colors to choose from, users can find a hearing device in this series that is right for them. The Naída hearing aids are Behind-The-Ear (BTE) hearing aids with three different performance levels, including Naída IX (Premium), Naída V (Advanced), and Naída III (Standard). 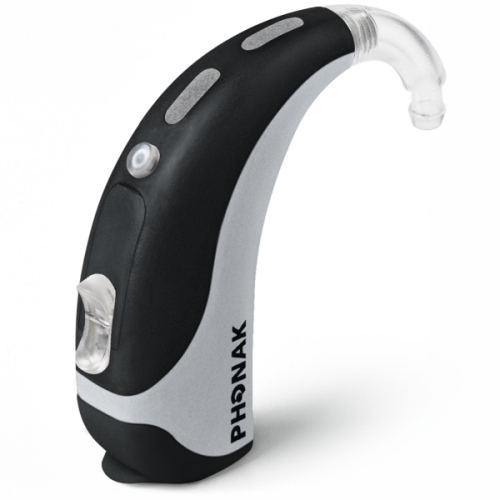 These Phonak hearing aids are premium, high-powered hearing devices that are water-resistant, making them very durable and long-lasting. They are designed for individuals with moderately-severe to profound hearing loss. 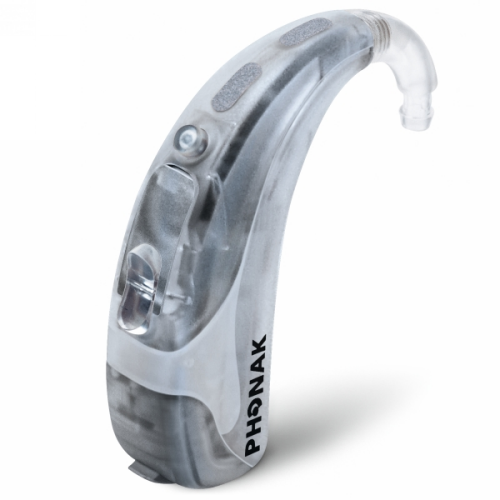 These Phonak hearing aids are advanced hearing devices that, like the Naída IX, are also water-resistant. These hearing aids deliver astounding speech understanding and audibility. 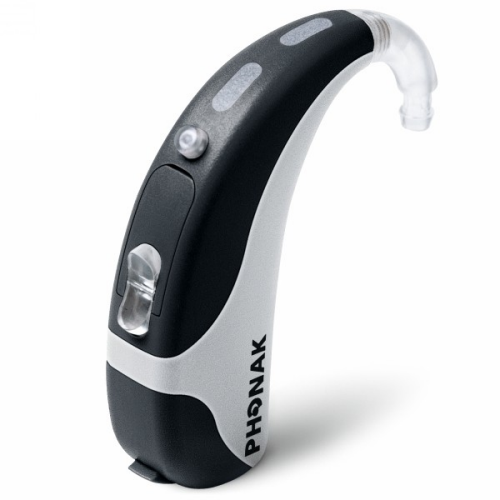 This series is available in a variety of different hearing devices, including a Junior size. 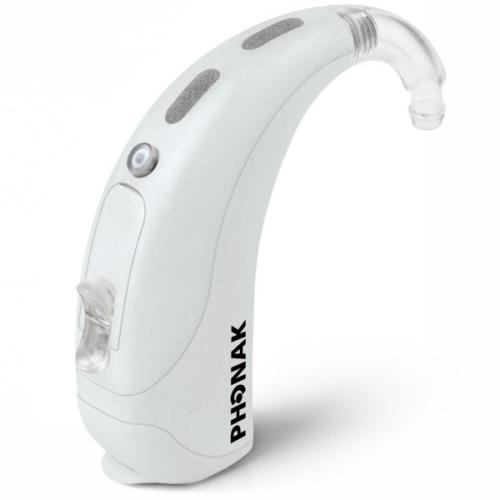 Although these Phonak hearing aids are the most basic of the Naída series, deliver superb audibility and high-quality speech understanding. These small hearing aids are available in several styles, as well as a Junior size. DuoPhone: An advanced technology that allows for much easier hearing during phone conversations. With just the push of a button, the Naída hearing aid user can hear his or her phone conversation in both ears, making conversations more enjoyable for both parties involved. ZoomControl with Direct Touch: This technology gives the user the power to choose where to focus his or her attention. This feature can be used with a remote control (including the myPilot), as well as manually. This is especially convenient in situations where the user cannot directly face the person he or she is talking to, such as in a car. EchoBlock: This echo-reducing technology allows for easier, more comfortable hearing in echoey environments. SoundRelax: This noise-reduction technology reduces unwanted or annoying sounds in the user’s environment, such as fans or motors, allowing the user to focus his or her attention on what is important. Real Ear Sound: Hearing aids that sit outside of the ear will often eliminate the user’s ability to pinpoint the locations of sounds in his or her environment. This technology allows users to hear more naturally, so they can locate sounds in the environment much more easily. WindBlock Management: This technology significantly reduces the sound of wind in the user’s hearing aid. Reducing this annoying sound can help the hearing aid user enjoy the outdoors much more. NoiseBlock Processing: This noise-reducing technology allows for much more comfortable hearing in noisy environments with large amounts of background noise. This technology reduces unimportant background sounds, allowing users to focus their attention on conversations with friends and family. SoundFlow: This technology allows the hearing aid user to move seamlessly between environments with much different listening situations. This allows users to move from a quiet conversation, to a loud environment comfortably, without having to make any manual adjustments to his or her hearing aid. VoiceZoom: This technology enhances the ease with which hearing aid users can have conversations with friends, family, or colleagues in noisy environments. The technology pinpoints speech sounds, and emphasizes them. At the same time, the technology reduces background noise to the side and rear of the user. SoundRecover: This technology allows users to experience a wider spectrum of sounds, as it returns high-frequency hearing to those who may have lost it. This gives users the ability to hear more natural environmental sounds, including birds chirping, children playing, or music. This technology can also increase the audibility of conversations. WhistleBlock Technology: This feedback-elimination technology allows for much more comfortable conversations on the phone. Whereas some hearing aids may produce an annoying whistling sound on the phone, the Phonak Naída hearing aids do not. Acoustically Optimized Venting: This technology reduces the user’s ear occlusion, making the hearing devices much more comfortable to wear. 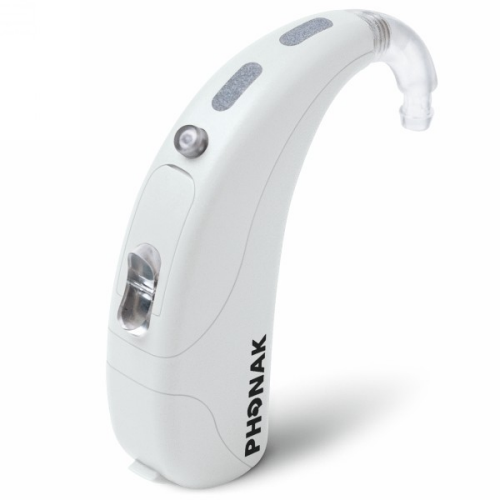 This technology is available in Phonak’s full range of custom products and styles, as well as BTE hearing devices with SlimTip Soft or cShell, xShell, or SlimTip. QuickSync: This feature allows users to control two hearing instruments with just one touch. When the volume or hearing program is adjusted on one hearing aid, it is automatically adjusted on the other. 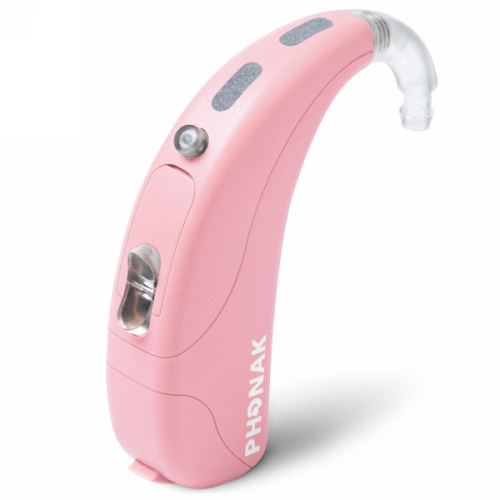 Naída IX SP (Super Power): This hearing aid is designed to deliver hearing to those with hearing loss ranging from moderately-severe to profound. 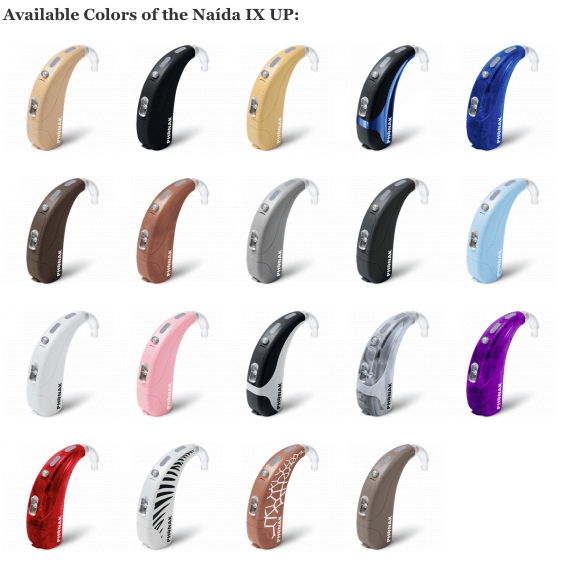 Naída IX UP (Ultra Power): This advanced hearing device is designed for individuals with severe to profound hearing loss. 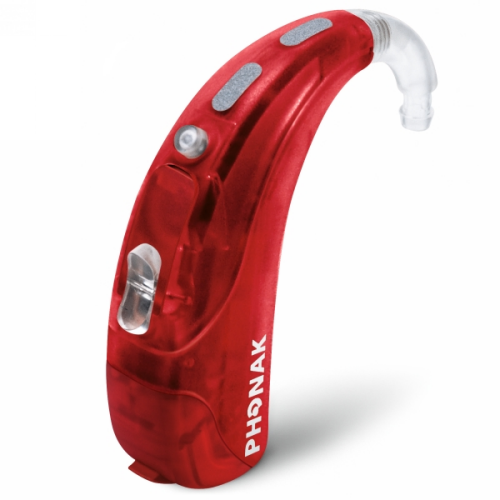 Naída V SP (Super Power): This hearing aid is designed for individuals with moderately-severe to profound hearing loss. 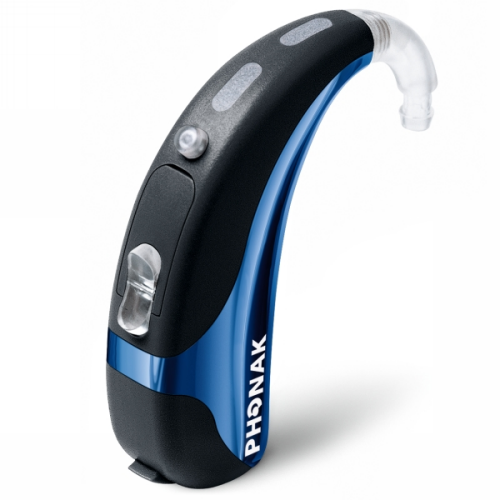 It features directional microphones to deliver enhanced hearing in noisy environments. Naída V SP Junior: This smaller hearing aid is designed for children with moderately-severe to profound hearing loss. With directional microphones, this hearing aid enhances the user’s hearing in noisy environments. Naída V UP: An ultra-power model hearing aid designed for those with severe to profound hearing loss. 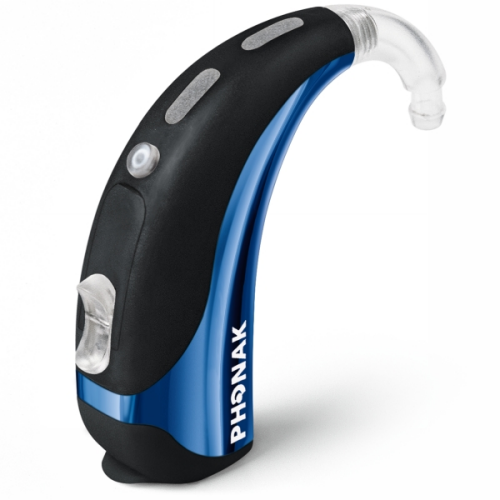 This water-resistant hearing aid features directional microphones for better hearing in loud environments. Naída V UP Junior: An ultra-power hearing aid designed specifically for children. It is water-resistant, and like the Naída V UP, features directional microphones that allow for better hearing in noisy environments. Naída III SP: A high-quality hearing device designed for individuals with hearing loss ranging from moderately-severe to profound. 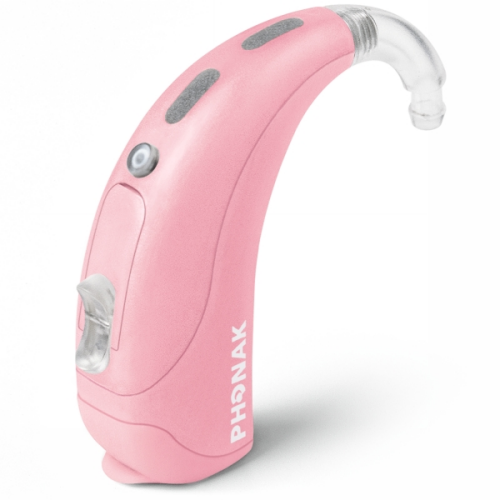 Naída III SP Junior: This smaller, children-specific hearing device is designed for children with moderately-severe to profound hearing loss. 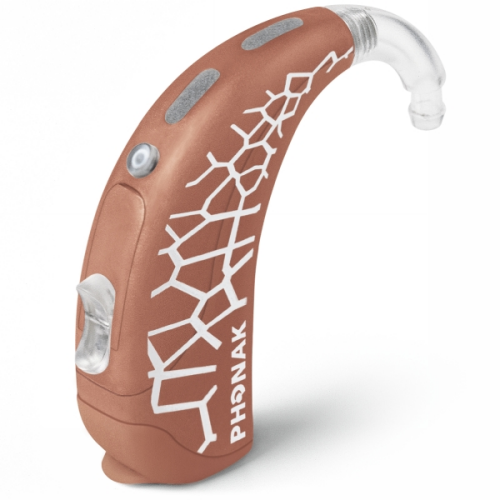 Naída III SP (dAZ): This advanced hearing device is designed for individuals with moderately-severe to profound hearing loss. With its added directional microphones, this hearing aid helps users hear more clearly in noise. 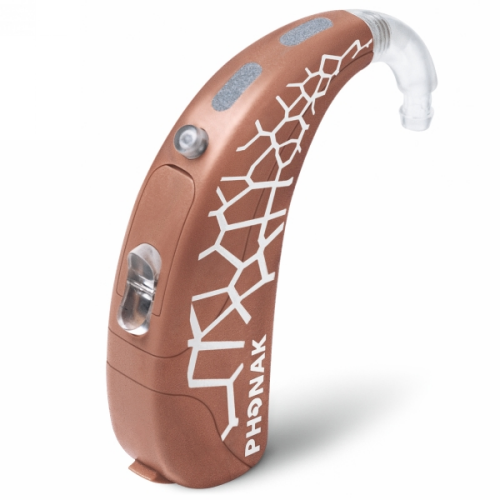 Naída III UP: This ultra-power model BTE hearing aid is designed to serve those with severe to profound hearing loss. It is water-resistant for maximum durability. 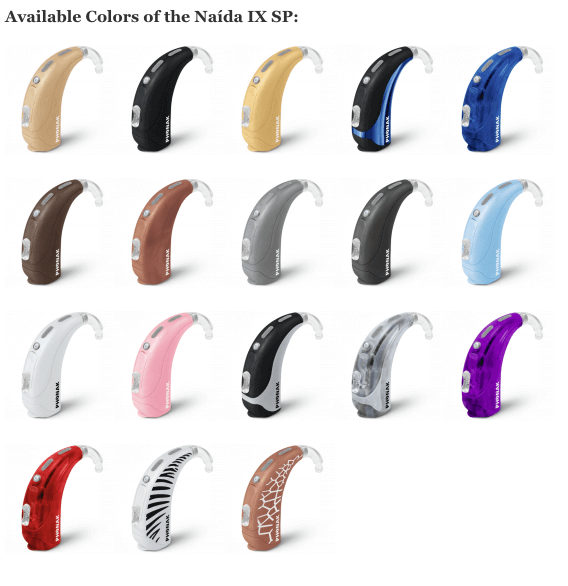 Naída III UP Junior: A child-specific, ultra-power model BTE hearing device with a slim, water-resistant design. 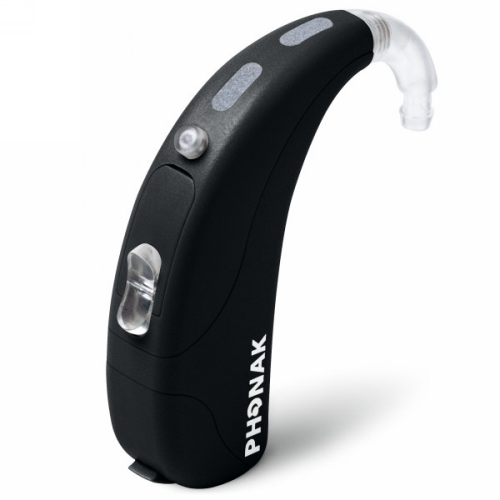 It is designed for individuals with severe to profound hearing loss. Naída III UP (dAZ): This ultra-power, BTE hearing aid features a slim, water-resistant design. With its built-in directional microphones, the hearing aid allows for much better in-noise hearing. iCom: A communication interface between the user’s electronic devices, and his or her hearing device. 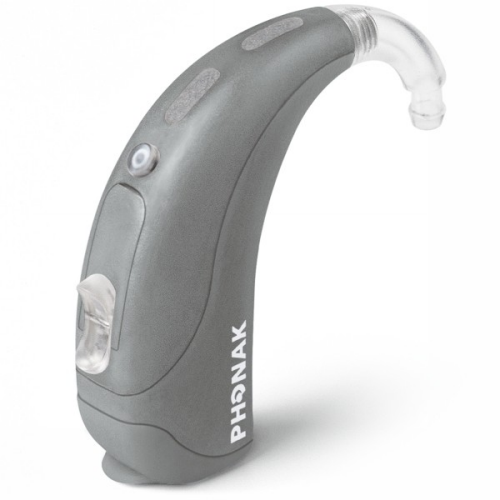 The iCom allows users to hear their electronics that transmit sound directly in his or her hearing aid. This includes televisions, phones, MP3 players, computers, and more. TVLink: This is a television-specific hearing solution that allows users to listen to his or her television’s audio much more comfortably. The device wirelessly, and almost instantly, transmits the television’s audio to the hearing aid of the Naída wearer. This lets users listen to their television in stereo sound (both ears), while his or her family can listen to the television at a volume that is comfortable for them. inspiro: This Dynamic FM transmitter is designed for teachers in either regular or special schools. This device wirelessly transmits the teacher’s voice directly to the hearing aid of the student (or students). 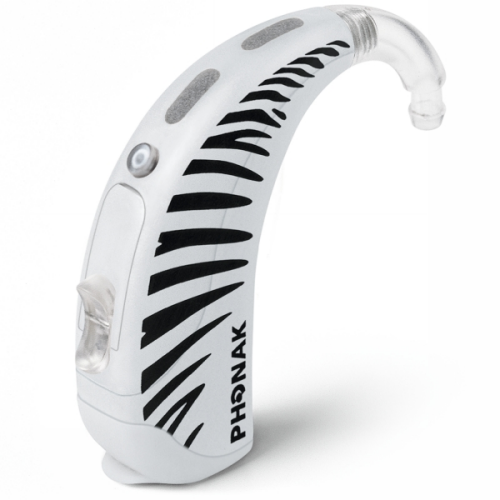 This provides the child with better hearing, and an enhanced learning environment. ML11i: This is a miniature design-integrated FM receiver designed for the Naída SP hearing aid. With automatic or direct frequency synchronization, the user does not need to make any adjusts to his or her hearing device to hear wirelessly transmitted audio. It features a sleep mode to help the user save his or her hearing instrument batteries. It is available in 9 different colors. myPilot: A remote control for the user’s hearing aid with a LCD. 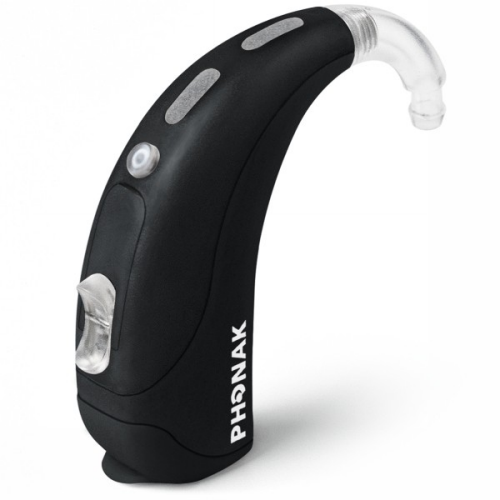 This remote gives users convenient access to many of the features of his or her hearing aid, including the status information of the device. This remote control can be customized to meet the needs of the user. My Phonak Naida Q beeps twice every 10 minutes. Any idea what this means. I changed the battery but still has the beeps. I’m writing from Italy. Please I would like to know if the PHONAK Naida III SP color beige product is still for sale or not. if it were no longer in production I would like to know which model was replaced. Please also could you give the information about an online seller.